Welcome to Wynne, population 3402. No rockstars. No major politicians. No media moguls. Things don’t change quickly in a small town, except when they do. It’s been pouring rain all summer long, and the disc jockey and local farmer are all of the sudden attached at the hip. It’s not only the rising river getting deeper and deeper. This is your basic water tower painting, tractor driving, tailgate cooler packing kind a guy chases the single, blonde, radio vixen with mosquito bite rage from his youth type of romance. Or is it the other way around? Low on drama. High on Love. Grab an umbrella because it’s a long wet summer. There are so many things I know to be true in life, and at the top of that list is the fact that M. Mabie writes one helluva good book. The all-feeling stories and unforgettable characters she has so brilliantly created and captured represent some of my all-time favorites. This author’s talent knows no bounds in my personal opinion, and getting to feel and experience and live the mesmerizing words she creates in each and every one of her books is something I love and look forward to with everything that I have. 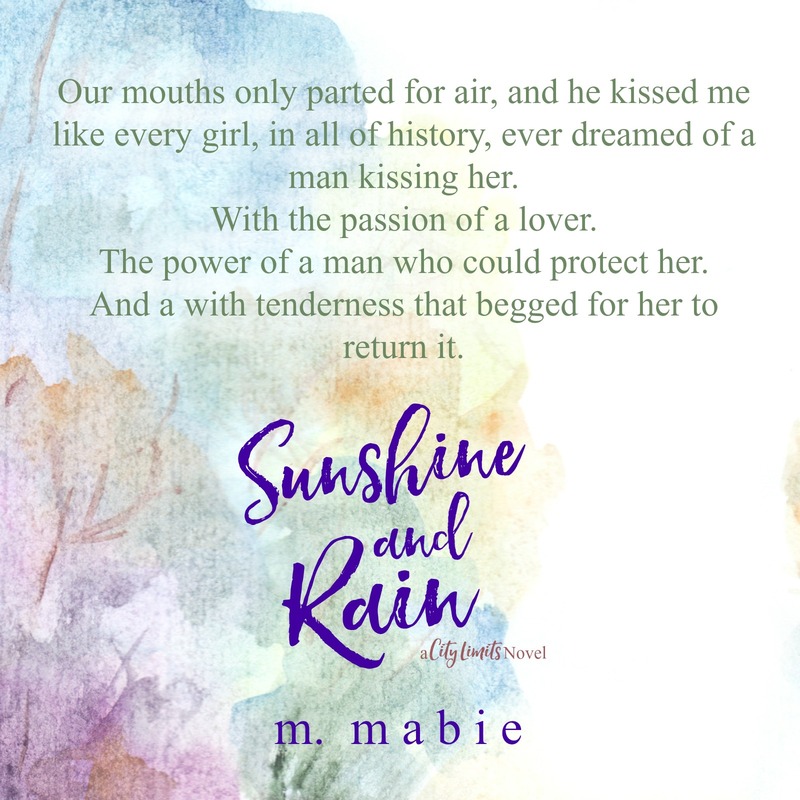 Every time I sit down to read a new book from M. Mabie I know that I am about to be blown away by what she has in store for me, and let me tell you, Sunshine and Rain was no different. I honestly don’t think there are enough words in the world to describe how much I loved this book, how good it felt to read it, or how amazing and wonderful Sunny and Rhett were to fall in love with. This book was sweet and swoony through every single page. It was refreshing and real and so beyond heart melting too. It was a story and a book and a world that just felt so darn good to be in, and falling in love with Sunny and Rhett and their literal amazingness is something I won’t soon forget. Sunshine and Rain was the epitome of a feel good romance that sweeps you up into its literal magic with everything that it has, touches your heart, melts it a whole helluva lot too, and has you feeling and experiencing every ounce of that magic all the way through. From the very first page of this book I was beyond enamored with the authentic, inviting, and charm filled world that M. Mabie so fantastically creates in this book. 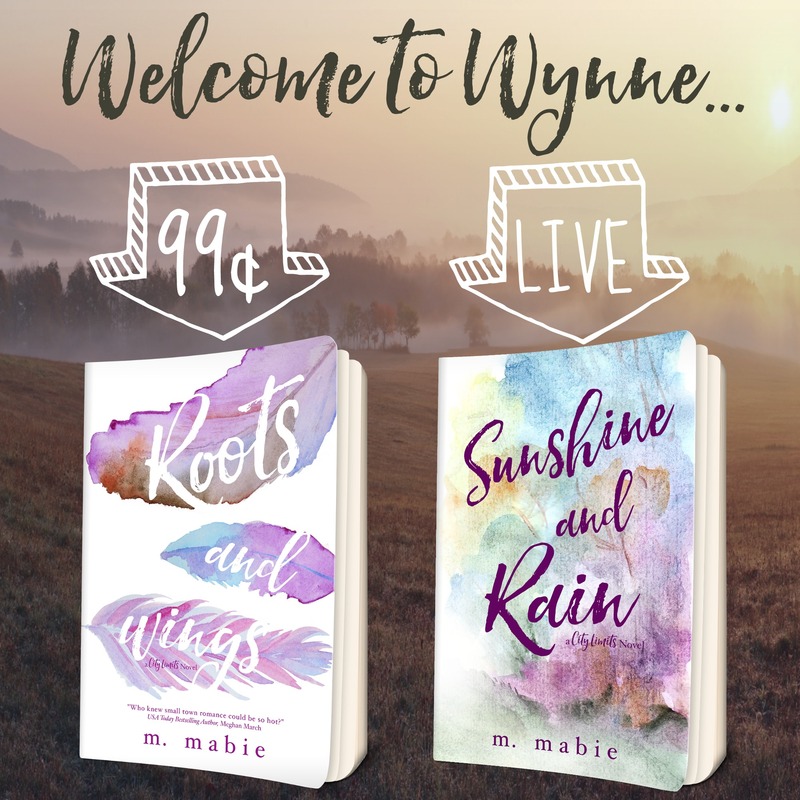 Sunshine and Rain thrusts you right back into the world of Wynne, population 3402, and it has you loving every second that you get in that place with its cast of characters that make you feel right at home. M. Mabie does such a phenomenal job once again of creating a world that feels so real, so all-consuming, and so right for this story and these characters and it all just fits as easy as pie. Wynne is a small town bursting with the most distinctive small town vibrancy that will have you wanting to take up residency within its limits in no time flat. The town of Wynne is almost its own character in this book, and in this series, so to be back within its wonderfulness felt darn good and darn right. This town may be small, but it is bursting with so much for you to love, and I am telling you that once you’re in its grasp, you’re never going to want to leave. Being back with the wonderfully distinctive characters I fell in love with in Roots and Wings was the cherry on top to a world that I seriously could not get enough of, and every moment with them in this book felt beyond good and so damn right. Sunshine and Rain is a story about so many things. It’s a story about second chances at what could be. It’s a story about two people who are finally at that right moment in their life for it all to click. It’s a story about how every single part of your past and your own personal journey might just have been leading you to the exact place you always needed to be. It’s a story of feel good moments, a heck of a lot of build, a town that comes together when it really matters, kisses in the headlights, sparks in the moonlight, and oh so many possibilities for two truly unforgettable characters. It’s also about how the world’s hottest farmer, gives the world’s best DJ a run for her money, and how along the way those two start to realize that while the past may be the past, and the present might not be as easy as they thought it’s be, the future is all theirs to be had. Sunny and Rhett’s story in Wynne starts with one heck of a memorable reunion, and follows these two as they try to see where all of the feelings and past and possibilities between them could take them if they actually open themselves up to it. You see Sunny and Rhett have a bit of past with one another. A past that is still kind of stuck with them in a way that will have you smirking at the fact that a small town never forgets anything. Nothing about that past is too angsty or drama filled, but they share enough of a past that it holds them back a bit from embracing what they start to feel for one another when they’re reunited in Wynne years after that past. The opening of Sunshine and Rain gives you that reunion, let’s you be there in those moments when Sunny and Rhett get their wheels turning about one another, and puts you with them as they start to see what could be. Both Sunny and Rhett are at a bit of a crossroads in their lives, trying to decide what they want, what feels right, and what they ultimately need in their life. Much of this book explores their own personal journeys of discovering what is most important to them, and what they’re going to do to get that and keep that. As the pages of this book turn and as you fall harder and harder for those two, you will get more of their story, you will experience what it’s like for them to realize exactly what they need and what’s been missing from their lives, and you will feel every ounce of heartfelt connection and spark they share. Sunny and Rhett’s characters were amazing, and I honestly can’t say that enough. They were real, they were authentic, they were easy to love and relate to. The way that M. Mabie so distinctively creates them both and their dynamic together connects you to them, invests you whole heartedly in every part of them and their story, and will have you rooting for them with all that you have. Their story may be low on drama, but don’t for one second think that that means it won’t hook you and sink you into it all with them. With the level of investment and connection you have to their characters, you are going to NEED every word of their story, you’re going to HAVE to know what happens next, and you’re going to WANT every single bit of what Sunshine and Rain gives you with them. You’ll love the vibrancy that emanates from Sunny, and the endearing nature that Rhett exudes on every page of this book. You’ll love the back and forth that those two share, and you’ll love how much it makes you blush when they make each other blush. You’ll bask in the fact that those two have a history, yet are bound and determined to change the course of it all, some way or somehow. You’ll love how in it they both become, you’ll love how they’re not afraid to go there when it really matters, and you’ll love getting to be there every step of the way with them as they come to realize what’s really important and what they’re willing to do to get and keep everything they share. You’ll feel the beginnings of something so right, something so needed, and something so good between those two, and the further they fall and the closer they get, you’ll need even more for things to work out for them. Did I also mention that those two will make you blush and melt and just fall oh so hopelessly in love with them through every single page of this book?! Well they will both do just that, and then some, and before you know it, you will be fighting and rooting with all you have for Sunny and Rhett and their sunshine after the rain. And don’t worry you’re pretty little head to much because you’ll also continue to blush and melt all the way through right along with those two. Trust me. There is no resisting the pull, the feels, and the blush worthy moments that Sunny and Rhett will give you in Sunshine and Rain. There is no resisting them at all. And that is just part of what makes this book so phenomenal and one of my top reads of the year. Sunshine and Rain is a book that feels beyond good to read. This book is the equivalent to a cool glass of sweet tea after a hot summer day, with its ability to make everything feel better and satisfy you in more ways than one. This book is like taking a deep, wonderful, and amazing breath that fills you up with exactly what you need and what you were missing all along. This book is as wonderful and warm as the sweet summer breeze, and the literal goodness that it exudes from every page will touch every part of your heart, mind, and soul as you experience what it has to offer. Simply put, this book is good. So damn good. It’s phenomenally written, exceptionally crafted, and it’s bursting at the seams with a love story that is equal parts small town, feel good, give you the butterflies and goosebumps while stealing your breath in the same second, kind of good that wraps you up in it all. It’s wholly consuming nature and endearingly charming and vibrant characters is the sugar on top to the sweetest damn love story this side of the Mississippi. Sunshine and Rain is a book that’s low on drama and high on love. It’s a book that wraps you up, gives you all the feels, and mesmerizes you with the literal amazingness it has within its pages. This book completely exudes what it means to feel and love and experience a story, and with its vibrancy and charm that literally knows no end, it is a book that you need in your life this very second. This book is Sunny and Rhett, their all-feeling and seriously sweet love story, and so much more too. 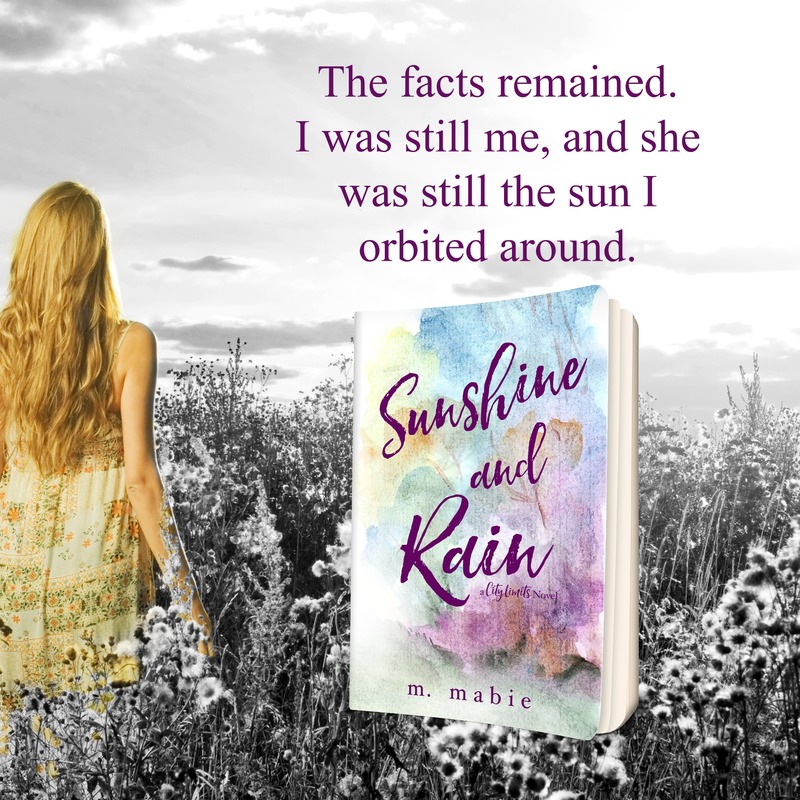 Through every single page of this book you will feel and experience and know the shear talent of M. Mabie’s exceptional writing with everything she gives you with Sunny and Rhett, and in the end, you’ll be thrilled you experienced all of the sunshine and rain this book so spectacularly gave you. Book One in the City Limits Series: ROOTS AND WINGS is currently ON SALE for 99¢ or FREE with a KindleUnlimited Subscription!